Don't you love it when you come across a blog you haven't seen before and every recipe looks like it was selected with you in mind? I was so excited when I discovered The Tattooed Gourmet. The pictures are awesome. Each recipe looks like I picked it out myself. I think I bookmarked every post. I mean, with recipes like Jamaican Firey Shrimp and Grilled Salmon with Wasabi-Ginger Mayonnaise how can you not? 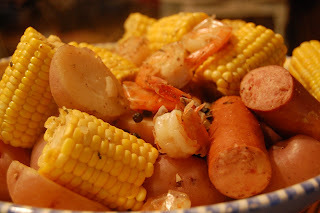 I knew that our afternoon was going to be hectic since we had a cross country meet so when I came across Bryan's recipe for Low Country Boil I immediately printed it out. Prep was easy. I did cut the potatoes in half because they were pretty large and that was pretty much the extent of it. Less than thirty minutes and dinner was on the table. Of course that is less than 30 minutes of cooking time... and doesn't include the time it took to get the water to boil so it wasn't quite as quick as I'd hoped but the taste was definitely worth it. Simple. Delicious. Put it on and pretty much forget about it until it's done. Perfect for my family who usually won't touch seafood and myself who loves seafood but doesn't like meat. I didn't have to share the shrimp and they all fought over the sausage. Everyone was happy. Dh even made sure I saved the leftovers so he could have them for lunch the next day. I will definitely be making this again! Now off to the kitchen to see if I have everything I need to make Bryan's Mini Steak Sandwiches with Horseradish and Tomato for dinner tonight! 4 pounds large fresh shrimp in the shell, I perfer no heads but some down here like them. Add potatoes to large pot, then add beer and water to fill the pot 3/4's way full and add the seasonings. Cover pot and heat to a rolling boil; cook 10 minutes. Add sausage and corn, and return to a boil. Cook for another 10 - 20 minutes or until potatoes are tender. Add shrimp to stockpot; cook 3 to 4 minutes or until shrimp turn pink. Drain. Serve with cocktail sauce. Normally this would serve about 10 -12 people. Instead of dirtying those plates just take that newspaper and cover your table (its better if you are outdoors less of a chance for a mess) and empty your basket onto the paper and then it is everyone for themselves. Be sure to peel the shrimp prior to putting them into your mouth. You could use pre-peeled shrimp but the shells hold a lot of flavor that is added to the dish. Plus if you are faster at peeling them than the rest of your party you get to eat more shrimp!!! How did I not notice this. Thank you for this post. That is one of my favorites too. It is great with lots of people outside just having fun.